Jake, a 14-year-old gadget whiz, didn't plan on a summer full of treasure, thieves, and danger. 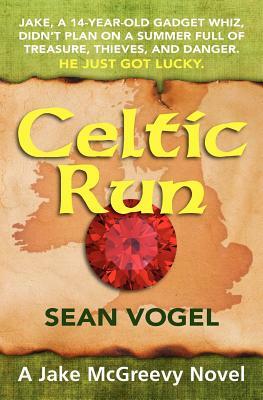 He just got lucky.While in Ireland on a class trip, Jake stumbles upon the first clue to a treasure missing from the Spanish Armada. Jake sees the riches as his chance to buy back the family sailboat and restore a piece of the life he enjoyed before his father was critically injured in an accident. Desperate to find the treasure, Jake teams up with Zach, his nemesis and class bully, and two girls in a clue-hunting chase across the Dingle Peninsula.Dodging would-be thieves, exchanging wisecracks with Zach, and concocting ingenious devices to get them out of scrapes, Jake leads the team as they connect piece after piece to the more than 400-year-old mystery. Growing up in a small town in Michigan during the 1980s, Sean Vogel was provided with an excellent garden for cultivating his writing career. With only a few simplistic video games and three television channels, he became an accomplished daydreamer and a creative outside adventurer. A son of a garbage truck driver, Sean often received "gently used" items from his father's route. With a bit of imagination and a little tinkering, these items were reborn as tools for battles against backyard bandits. These childhood experiences would later serve as the foundation and inspiration for Jake McGreevy's gadgetry expertise. Seeking his own adventures, Sean joined the Army via an ROTC scholarship at Colorado State University. Living in Germany for several years gave him the opportunity to travel extensively in Europe. During his time in the Army, he served in the Field Artillery and Signal Corp, rising to the rank of Captain and receiving the Bronze Star Medal for his service in Iraq. Sean started drafting novels out of boredom during long deployments in the military; a pen is easier to carry than a guitar. But he soon fell in love with the frustrating yet satisfying science called writing and has been hard at work ever since. When he's not helping Jake get out of tangles, Sean is a department manager for a large aerospace company. He lives in Denver with his wife and daughter and their two dachshunds.